Best Kitchen Basics beats the revolutionary drum in the domestic kitchen – no longer are high-end techniques or recipes the sole domain of multi-award-winning restaurants like Best's Sydney fine diner Marque and his bistros Pei Modern in Melbourne and Sydney. Here, Mark Best breaks it down, putting the individual elements of each recipe into the home cook's hands and empowering them to think differently. It includes 100 original recipes built around 30 accessible ingredients – from eggplant to pumpkin to chocolate and eggs. Marque is a highly illustrated, contemporary recipe book, celebrating and reflecting on Marque, the succesful Sydney restaurant. 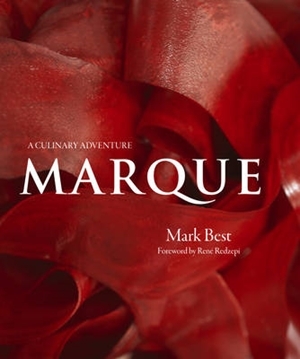 Included is the personal journey of chef and owner Mark Best and approximately 80 of Marque's signature recipes. Most are complete dishes but the book also contains a myriad of smaller recipes and techniques which are the backbone of chef, Mark Best's, creations. A stunning book to treasure as both a compilation of beautiful recipes and a record of one of the world's best restaurants.